Sometime it becomes a bit time-consuming to write a new post. I have a habit of investigating ex. different recipes before I write one down. Simply just to see, if there is a better, a different one, than mine with maybe another twist. And sometimes I remember a dish, that I haven’t tried to cook before and therefore need some guidance. This recipe is a very good example of why things sometimes become a bit cumbersome. It’s no secret that for a month ago, I enjoyed the sweet life in Antalya. I was busy with my mini-vacation (as you can read about here), where I lived half-time with my dear father-in-law. I was lucky, that he invited me out one day – in an exceptionally delicious place called Loti, located in the Lara area. Here we got a dish, that completely swept my legs away – Osmanli güvec it was called. All the food we got at that restaurant was exceptionally delicious – in all its simplicity. Because it was ordinary turkish food added (a lot) of finesse. But this stew was simply so impressive and tasted so amazing, that I just had to figure out how to make it myself. Or something that reminded of it. But because it is neither particularly polite nor probably possible to ask for a restaurant signature dish, it took me some time to find something, that reminded me of it. For granted – it’s not quite the same. But we are pretty close. You have probably encountered güvec before. In fact, it covers the word “stew”. And here, as you know, you can use awhatever you have or like – pure vegetables, chicken, veal, beef or lamb. Like the many other stews, güvec is incredibly tasteful and should really just stand and take care of itself, so the meat and vegetables gets tender and flavorful. Not so much hocus pocus about it. What makes the dish a little more special is, that there is also cheese in and a thin lid of bread on top. It just adds something extra and turns it into an eminent show-stopper, when cutting the lid open and excitedly see, what’s inside. At least I was waiting in excitement (maybe also because my father-in-law had praised the food to the clouds and looked so happy and contented and proud, when we got the dish). So I went through the web for recipes for Osmanli güvec. It was not easy. Because everyone was in Turkish – and I’m not that good at it. My recipes usually come from my mother-in-law or family. But in between I get inspired from cookbooks or restaurants. Especially if it is a dish, that I haven’t previously made. I always put more recipes together, add something, withdraw something until it recalls something I’ve tasted or seen before. And so it was with this recipe. I made the stew on the stove (and afterwards in the oven). Something I really miss in my kitchen is gas. It just adds an extra touch to the taste. And I think that’s probably what I think is missing. So next time we are going to cook Osmanli güvec, I think we’ll try it on the barbecue next time … it’s usually adds something extra too. 1: Cut the vegetables and the meat into equal pieces - they may be a bit rough (potatoes and meat in a little smaller cubes). 2: Fry the meat with approx. half of the butter - leave it all brown well. Add the garlic and fry them gentle too. 3:Take the meat up and put in the potatoes. Stir until they are tender (I sometimes add ½ glass of water, so it goes a little faster). Take the potatoes up when they are tender. 4: Bring the oil to the pan. First fry the eggplants and then the other vegetables. 5: Bring all the ingredients back into the pan. Season with salt and pepper and let it boil on a low heat for about 1 hour. Make sure it does not boil completely, but do not get too much water. 6: Then prepare the dough. 4: Let the dough stand and rise for approx. 30 minutes. 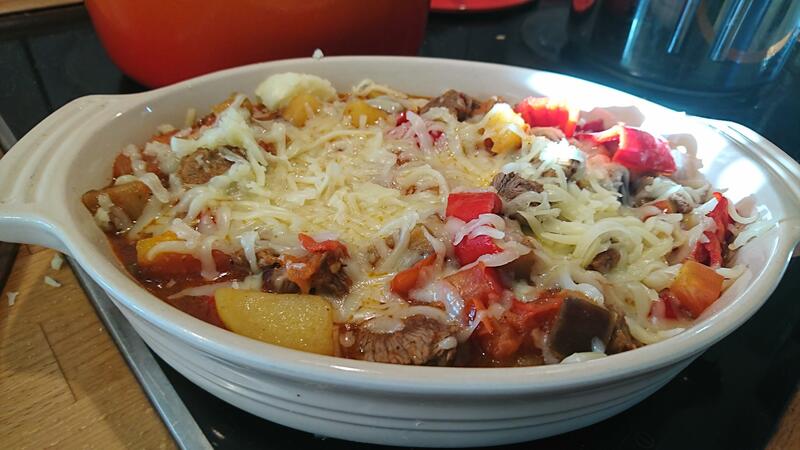 1: When the casserole is cooked, put it in a oven-proof dish and put butter on top of it. 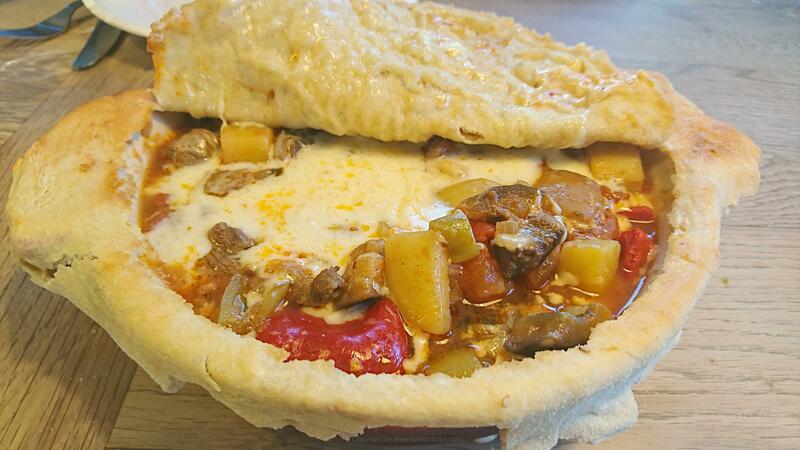 The stew must be in a single layer (as thin as possible). Maybe you ned 2 smaller dishes. 3: Roll the dough into 1 or 2 thin pieces (depending on how many dishes you use), so they are just big enough to form a lid over the dishes. Put it slightly down the sides to close it properly. 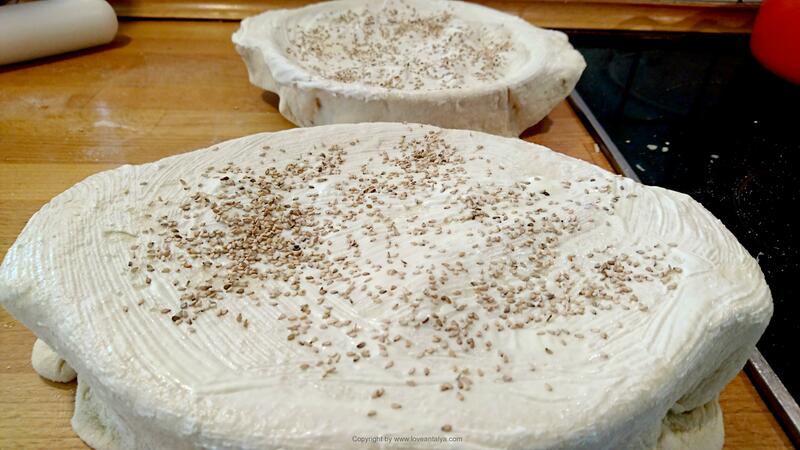 4: Grease the dough with oil and youghurt and sprinkle with Nigella seeds and sesame. 5: Put it in the preheated oven at 250 degrees for about 10 minutes until the bread is slightly browned on the top. 6: Put the dishes on the table immediately and open the lid there. I really do not serve much else for this dish than a green salad - possibly with some fresh onion rings mixed with parsley, olive oil and sumak. 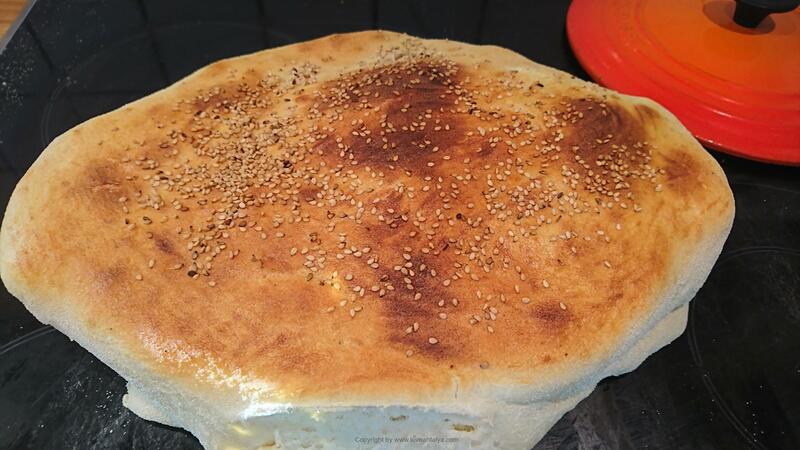 It is intended that you sit and break bites of the delicious bread, so you can collect the meat and vegetables with it. It's quite cozy and just makes that taste even better (and the kids thought it was so fun to do so).